And we no longer store costumes, so we have an abundance of space that isn't really utilised these days, and the decision to let it out has been made. We have a storage unit just outside Olney where we keep the stage trailer and portable staging, so I'll just be upstairs from all of that, which brings everything together. 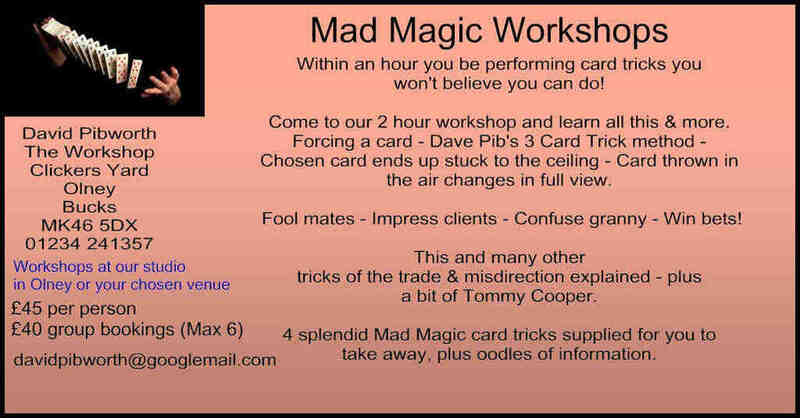 To be honest, one can run magic sales from anywhere and the same applies to our other business where I represent Ray Galton and Alan Simpson's scripts with their Tony Hancock and Steptoe and Son scripts. By the way, did you see them win a BAFTA honour on the TV on Sunday? They accepted their honour at Ray's house as they're quite old now and don't go out so much, but I was pleased to see them accept from the very room where I joined them many times for numerous cups of tea while we adapted their scripts to the stage. And they haven't lost it. Alan said ''We'd like to thank everyone who helped us get to where we are, but they're all dead now, and if you'd left it much longer you might have missed us''. But back to moving, oh my goodness. We are getting rid of everything that isn't required, which is difficult as I'm one of those people who keeps things 'just in case'. But it is time for a full clear out, as it needs to be empty, and even my beloved piano, which we used in so many shows and for recording is going as I just don't need it and have a piano at home, so no excuse to keep it. I've made a pact with myself, that anything that hasn't been used for 2 years goes, and by golly there's a lot of stuff that hasn't been used for two years. Props, costumes, sound equipment and so on and so forth, but I'm getting the hang of it now and should be done by the end of this month. For your information, the upstairs space is @760 sq ft and the downstairs is @340 sq ft. Now onto the selling bit. It is situated in a very desirable area of Olney, nicely out of the way, with plenty of parking. It's at the opposite end from the Market Place, so not too busy, but yet within walking distance of a lovely coffee and sandwich shop and you will have a lovely landlord, who is happy to give you a guided tour. Just phone me on 01234 241357 or 07879 414110 for a natter if you're interested in letting it.